I got a late start but was hoping to line up several movies for the day. In the end I only saw two, a comedy and then a documentary. Salvation Boulevard starred Ed Harris, Greg Kinnear, Pierce Brosnan, Marisa Tomei, and Jennifer Connelly and was a farce based on the Christian mega churches. It was hilarious! If you can laugh at organized religion look out for this one. Religion and cults seemed to be a running theme in the festival lineup. The second film I saw was an Australian documentary about an American story. It was called Shut Up Little Man! An Audio Misadventure, and I really enjoyed this one. Back in the 80’s these two young guys from Wisconsin moved out to San Francisco and was living in a dump apartment with very thin walls. Two men lived next door. One sounded like a raging homophobe and the other sounded gay and they would both get very drunk and have horrible arguments. The guys started taping them. In the pre-internet era, these tapes went viral. In fact this young filmmaker in Adelaide Australia heard about them this way. In telling the story lots of questions come up regarding privacy and morality. The Q&A was great. There was an older gay gentleman in the audience who was really angry that these young men capitalized on these men, especially since a lot of the content of the arguments was homophobic rants, which taken out of context becomes “frat boy humor”. He had some very interesting points and the filmmakers encouraged him to share his thoughts. Once again I had the opportunity to see three documentaries on the day I volunteered. The first was Being Elmo: A Puppeteer’s Journey which I had already seen. After the film I ran into the editor and told him I’d seen it twice now and I laughed and cried the second time just as I had the first. He asked if I’d seen it the first time at the volunteer screening and added that that was a highlight for them. Everyone involved with the film was so nice and very willing to talk to everyone who had questions after the screening. Did you know there is a “muppet geek” community? There were some bloggers at the screening who’d been at multiple screenings of the film because of the Jim Henson content. Oh, and when we were setting up for the screening we reserved five seats and the theatre manager said those were set aside in case “Bob wanted to come see Elmo”. Bob = Robert Redford. I started to have a mini heart attack because where I was positioned for the screening, I would have been watching Bob watch Elmo. Setting aside seats for him as well as for the jury happens at a lot of screenings but due to schedules often get rearranged and they don’t use them. Alas, he didn’t come to the screening, and that’s probably a good thing. I don’t know if I could have taken that. The second screening was a documentary called Rebirth. It followed five individuals who lost family on 9/11 filming them each year since the tragedy. Once again, I absolutely sobbed. As a mother, one of our fears is the thought of dying and leaving our children motherless. Because of this very real fear, the teenager who lost his mother really moved me. I seriously wouldn’t have been able to deal with the rest of the day if the film hadn’t ended on a positive note for him. This film wasn’t exploitive at all but beautiful. One of the gentleman profiled in the film, a rescue worker who lost his best friend, was there and people were just walking up and hugging him afterwards because they were so moved. The last documentary of my shift I knew nothing about. I knew it was the third in a trilogy and it was called Position among the Stars set in Indonesia. At the Q&A I learned that Indonesia used to be a Dutch colony and the filmmakers, brother and sister, were of this mixed heritage. This film was an unexpected treasure. First, it was the most beautiful film I saw at the festival. Several of the shots could have been stopped and framed. It was also a fascinating look into a multi-generational family dealing with the changing times, from the grandmother straddling village and city life to the teenager living in a slum but still wanting a cell phone and to go to the mall like teenagers in America. She becomes the family’s only hope to escape poverty. A. would never sit and watch this film but boy I wish I could get her. It would make her very appreciative of what she has. Funny, one of the elements of the film is an uncle who raises fighting fish which he bets on in hopes of making a fortune. Something significant happens to the fish in the documentary and so one of the audience members asked about the fish at the Q&A. The director said that the government has made changes to no longer allow the importing of these fish for betting. So now he says that two men meet and place their cell phones standing up next to each other on vibrate and then people call the phones. The first one to fall loses. It just goes to show that there is a very strong belief in lower classes that gambling is a way out no matter what. As I walked around Park City I ran into a few boarded up houses very close to the heart of the action and thought what is up with this? Why would there be these little houses boarded up in prime real estate territory? I was talking to a local about this, someone who has lived in Park City all their lives when in the early days of Sundance the filmmakers used to hand out tickets on Main Street and beg people to come in and see their films. He told me that he knew the guy who owned the houses and he’s renovating them. He paid nothing for them and now they’re million dollar homes. Wednesday was a volunteer theatre shift day. My job was to help people re-enter the theatre after they’d gotten up to go to the bathroom and I saw two celebrities in line to see the documentaries for the day with no fanfare. One of them was Todd Oldham who probably thought I was a stalker because I kept staring trying to figure out the man behind the beard. The other was an actor I’ve seen a ton on television but I don’t know his name. It will take me awhile to figure out who he is. I was also able to sit in on one documentary called Grab, which was very good. It’s the type of documentary I love, giving a glimpse inside a culture the average person would never have access to and to see how traditions are born. After my shift I stayed at the theatre and queued for a ticket to see Troubadours, which I really loved. David Crosby had some of the funniest lines in the documentary. It was a packed house because folks were hoping that Carol King or James Taylor would actually be at the Q&A but because the premiere had already happened they weren’t there. We did have a Q&A with the filmmaker. The audience was really interested in knowing why Joni Mitchell who is part of the documentary was not interviewed in it and the filmmaker had to explain diplomatically that she declined and she wasn't the only one. He didn't add any additional details. Before Troubadours I had to wait in the volunteer line and I struck up a conversation with a young volunteer from New York who works for the Food Network. She was super excited because one of the only things she wanted to see at Sundance was a short made by MCA from the Beastie Boys and she actually ran into him, told him how much she wanted to see it and he said, well I’m headed to the airport so have my ticket. She was over the moon. I of course asked her a ton of questions about Food Network (and the MCA encounter) and also the films she was there to see. It’s representative of some of the great conversations I’ve had with other volunteers. There were three young ladies on my shift who had all applied to film school and were telling me about that process. I had to laugh when one of them asked me if I was going to film school. I answered with, “No, that ship has sailed”. Here’s a list of some of the other folks I’ve met. The younger folks all seemed there to make contacts. I think English filmgoers are pretty stoic. My friend L recently told me she went to see the film The Secret in their Eyes at a London cinema and the audience clapped at the end, something she’d never seen before. When we got back here and I started going to movies again in the States, both A and I commented on how easily the audience responded. Anything that might give someone a hint of a smile brought about belly laughs. When I went to see Let Me In a few months ago I was annoyed by all the things the audience laughed out loud about. It wasn’t that funny. Fast forward to seeing Being Elmo: A Puppeteer’s Journey last week where the film was introduced by the director who watched the film with us and then fielded questions afterwards and again the audience was so animated. Now the film was absolutely sweet and deserved the laughs and noises of approval but it made me wonder if what I was experiencing the rest of the year at other movies was the Sundance effect. Are folks here so used to going to films with filmmakers where they feel the need to be so encouraging that they are overly effusive? Oh, and P.S. if you don't mind subtitles I recommend The Secret in Their Eyes. It reminded me a lot of a 70's era Al Pacino film like And Justice for All. Tuesday was my first day of volunteering at the theatre. I seriously had no preconceived notions of being able to see the films but lo and behold my first day I was an inside usher with a headset and everything. Ushering inside the theatres means watching for pirating, making sure cell phones and other electronic devices are off, and of course directing people to the loo. It also means you get to watch the films and the Q&As with the filmmakers before cleaning the theatre for the next screening. Wearing the headset was kind of interesting because at least at our theatre, the manager is very strict about not letting people into the theatre once the film has been introduced. The filmmakers are usually seated close to the door and besides people coming and going being distracting to the viewers, supposedly it drives the filmmakers mental. Inevitably as the movie was about 5 minutes in I’d hear someone outside the theatre message to our theatre manager because someone was begging to get in. The answer was always the same, sorry. So I got to see three documentaries on my first shift so after that day, I didn’t feel like seeing films in the evening and just headed on home. Here are the titles and a few brief words about each. Miss Representation – I hope this gets distribution because it needs to be seen by everyone, especially parents and teachers. The documentary does an excellent job of depicting the media’s images of women in a very non-partisan way. There are some excellent women in media, the arts, and politics interviewed. Granito – I think I would have responded more to this film if I’d seen the director’s earlier documentary When Mountains Tremble, since I had no knowledge of the genocide and conflict in Guatemala. However, it was very interesting and amazing to see how sometimes true documentary filmmaking can be capturing a moment in time that no one else is capturing. I think so often people take for granted that they don’t live in a country where the situation is so horrible that they must leave to make a better life. The Black Power Mixtape 1967-1975 – I had skimmed through the description and the word “mixtape” made me think this would be more music-related. Instead the filmmaker was using that term to describe the mixture of footage he compiled together of Swedish journalists interviewing key players in the black power movement happening in the United States. During this film I really wished I wasn’t wearing my volunteer uniform because I really wanted to ask some questions. I was curious if during the making of the film if the Swedish filmmaker had watched interviews that maybe American journalists had done with these same players in that time period to see how different the interviews were. Without the internet and the freedom of talking to someone outside the U.S. I wonder if they were more expressive about their feelings. Again, really nicely put together, and many of the cast of Pariah were in the audience watching this film. And I mean interesting the way the word "breathtaking" was thrown around on Seinfeld to describe that ugly baby. I was waiting in line on Monday to get into a press and industry screening of a film called Little Birds because I missed seeing an audience screening when someone in line started talking to me. She was a tiny blonde woman who also wanted to see the film. It was an odd conversation because without asking me anything about me she started grousing about the fact that it used to be the people that volunteered for Sundance were all aspiring or acting filmmakers, writers, or actors. Now as she’s standing there talking to volunteers, she finds out they are opthamologists or secretaries and what’s the point of talking to them at Sundance, when she can talk to them any time. I thought to myself, should I tell her right now not to bother with her next statement or question since I’m the riff raff? She didn’t win me over anymore when she told me she’d gone to the premiere of Being Elmo and said she felt like she’d had “treacle poured over her” with an eye roll. As one of the Sundance programmers said when introducing Being Elmo, if you don’t like this film you must have come into this world as an adult and never been a kid. After listening to this woman, it should be added or you insist on carrying your European sensibility to that jaded level that grates on American nerves. I actually didn’t mind that there were no spots available for the film so I could walk away and not be talked at anymore. With no volunteer shifts on Monday I was still trying to decide which film to see in the morning as I drove to Park City. Red State, Kevin Smith’s film looked most interesting to me but I didn’t think there was a chance at getting a volunteer ticket so I headed over to see Higher Ground, directed by and starring Vera Farmiga. Higher Ground is adapted from the Carolyn Briggs’ memoir, This Dark World, which I now want to read. The festival film description calls it a “moving story about the transformative powers of faith and doubt”. What was great about the film was it wasn’t heavy-handed at all and it wasn’t preachy on any particular side. Vera conducted a Q&A after the film and spoke about the challenges of a directorial debut that spanned eras and all that means to a production as well as battling pregnancy hormones the whole time. Her character in the film starts out as a small child and grows to an adult. We were all pretty amazed at how much the girl playing her character as a teenager really looked like her and it suddenly made sense when the credits rolled and we learned it was actually her 16 year old sister who played the part. Her sister was there at the screening as well but busy watching Vera’s toddler so she could answer our questions. Carolyn Briggs was also there and fielded a question herself. When talking about religion I thought she said something really profound and I’m really paraphrasing here but it was something like religion provides one with all the answers, which makes living easy. But it takes a brave individual to live with questions. Questions I wanted to ask Vera at the Q&A but would have never dared since it would have blown my serious movie lover cover… what does George Clooney smell like? Working with Scorsese, Leonardo DiCaprio, Matt Damon, Jack Nicholson and Mark Wahlberg on The Departed, tell me every single detail. Oh, and hottie alert in this film - Boyd Holbrook, who plays her husband when he was a teenager. After the film I stared at Richard Ayoade from the IT Crowd as he chatted with another volunteer I’d been talking to in the hallway. I thought I’d get out and enjoy the sunshine and take a walk along Main Street. I saw the photographers and the autograph hounds with those stacks of pics they then sell online ascending on Lea Thompson. One of them put a racy glossy black and white pic in front of her and she said, “Ooh where did you find this one?” with a giggle. I then headed over to the press tent and sat in on a press screening of a documentary called How to Die in Oregon. Did you know that Oregon as well as Washington allows someone who is terminally ill and has less than six months to live to get a prescription to end their own life? I knew this movie would be a downer and it didn’t disappoint. I have never been so grateful for the dark of the movie theatre as I sobbed throughout the entire thing. The content was excellent and showed a range of situations. Walking out of the theatre I didn’t know how I stood on the issue but I know that I felt like the filmmaker made me understand and appreciate the feelings of everyone in the documentary. Some of my fellow volunteers said that many of the people in the documentary were at the documentary premiere and how moving the process was for them. I'm glad I saw it and it reiterated some advice I had received from a fellow volunteer, go to some films you know nothing about and might not pick for yourself. My last screening on Monday was in Salt Lake City and it was a film called Another Happy Day, described as a dysfunctional family drama, written and directed by a very young Sam Levinson. This is where my streak of great films comes to an end. I’ve talked to other volunteers who really liked it but I got way sick of Ellen Barkin crying and some of the characters being caricatures that were just too amped up to work. No doubt this will probably get picked up for distribution, because of the all-star cast but it won’t be a film I’ll sit through again. One fun aspect of the screening, when I was waiting in line to get in there was a group of teenage boys hanging out also waiting to go in and their conversation made me wonder if they were in a film in the festival. When Another Happy Day starts rolling I realize they’re all in this film. What was great about Monday… it felt really decadent that my only responsibility and pursuit was to see as many films as interested me that day. Three in a day, when else would that seem normal unless at a film festival? Last day of volunteering – I wrote down a list of films I’ve seen so far in the festival and told H that I’m up to twelve. He shook his head like that sounded like nothing he’d like to do. The thing that is pretty great about seeing films here is how dedicated the theatre staff is to making the movie going experience the best it can be. No one is allowed into the theatre once the introduction of the film begins. Everyone in the audience really does turn off their cell phones, they keep the talking to a minimum, and of course the sound and picture quality is the best it can be. But life after I get home from the festival has gotten in the way. A's best friend from England is coming this summer for a few week visit and then A & J will be flying to Singapore to catch up with J's family. A will be with them right up to when school starts. Very exciting for A but trying to use some points to book her travel and coordinate with the family has been stressful. So here are a few pics from Monday to make due until I can sit down and write. I met up with my colleague J yesterday. She booked us tickets to see Pariah in Salt Lake City. 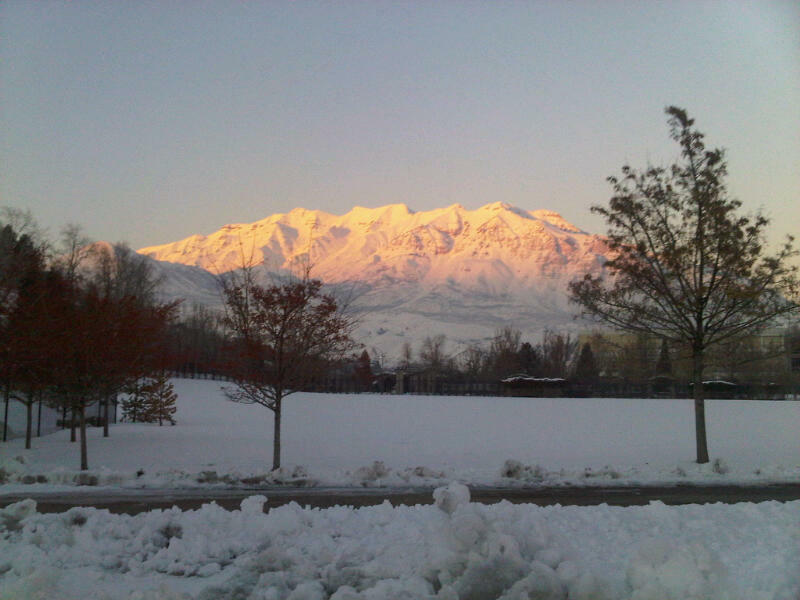 Not only are their Sundance films in Park City, but several are screened in Salt Lake City, Ogden, and the Sundance Resort in Utah County. The guide to Sundance in the newspaper last week talked about SLC being the best place to see the films and after yesterday I would agree. The parking issues aren’t severe, and there isn’t the media circus that is Park City to distract from the purpose. Meeting up with J ahead of time was funny because right now my attitude about the festival is nothing but positive having seen two great films. She’s been going to Sundance screenings for years and seen some things that she thought were crap so she’s much more level-headed. But this time around, we both agreed she picked a winner. Pariah had us laughing and crying at the end, and was beautifully shot. After the film almost all the principal actors, the writer and director, producer, cinematographer, and even the costume designer all came on stage to answer questions. The film has been 5 ½ years in the making, yet was filmed over 19 days in Fort Greene in Brooklyn. My favorite film genre has always been the coming of age story and this one is a favorite in that category for sure. One thing that was kind of funny, we were in this big theatre sitting in the balcony to see Pariah and the lights went down, then just as the opening Sundance credits rolled, there was an issue with the lights and they came back on in the balcony. You could still see the screen but it was a bit faint. A few random folks in the audience shouted “lights” hoping someone in the volunteer crew would fix the issue before the actual film began. Then when the film began and it hadn’t gotten fixed, a desperate sounding “LIGHTS!” came from the audience. I turned to J and started laughing saying “Oh my God lights people, lights!” in the most pleading and desperate voice. It was as if all these cinephiles were going to lose their minds if the film wasn’t shown in the most perfect of settings. They ended up stopping the film until the light issue could be sorted and then started again to great audience applause. Later last night there was a film that I thought A might like and I’ve got two guest waitlist vouchers to use so we headed back to downtown after dinner to see the film Like Crazy. We stood in our respective lines with our waitlist and volunteer tickets and both got in. As we stood in line we both talked to other festivalgoers. I had a nice chat with some fellow volunteers who were sharing their faves so far. I was reminded once again how Americans really will bare their souls to the folks they’re queuing with and during the festival this has made me very happy. As I was waiting for A to join me I picked two seats towards the back for us and just as we were settling in for Like Crazy to start, who got ushered in and seated among us normal folk? Tobey Maguire. He walked about a foot from A, who I thought was going to burst into tears. As he was seated her comments were, “OMG Spiderman, our mission is complete”. I don’t think she watched the film, she watched Tobey watching the film. He really did look like a normal chap. Dressed in jeans and a jacket he blended right in and wasn’t with an entourage, he was alone, and we saw him exit out a side exit during the middle of the Q&A after the film. Oh, so how was the film? I enjoyed it. The female lead who A thought looked so familiar, was beautiful and I could see her really having a career after this. The end was a bit ambiguous leaving everyone to wonder if they stayed together. The director wanted it that way. So far I’ve loved everything I’ve seen. Will today also be a success? Fingers crossed. This probably won’t go down as my fave Sundance day. A got home late last night from a friend’s house so we didn’t have time to sit down and look to see if there was a film today she’d be interested in seeing, and so she just wanted to go and walk along Main Street. I woke up out of sorts but bundled up and got ready to go after morning errands. SLC = Sunny, Park City = Quite Different. When we got on Main Street immediately we saw Peter Dinkalage and Bobby Cannavale catching up with each other. If you haven’t seen The Station Agent which they are both in with one of my favorites, Patricia Clarkson, definitely put it on your list. Just a few steps away we saw Paddy Considine. After that and the snow starting to really pick up, I would have been fine heading home. We walked around a bit longer, saw some of our favorite buskers from Salt Lake, and then headed out. I was concerned with the snow coming down we’d be delayed getting home but again, SLC = Sunny and we were amazed at how different the climate was when we returned. 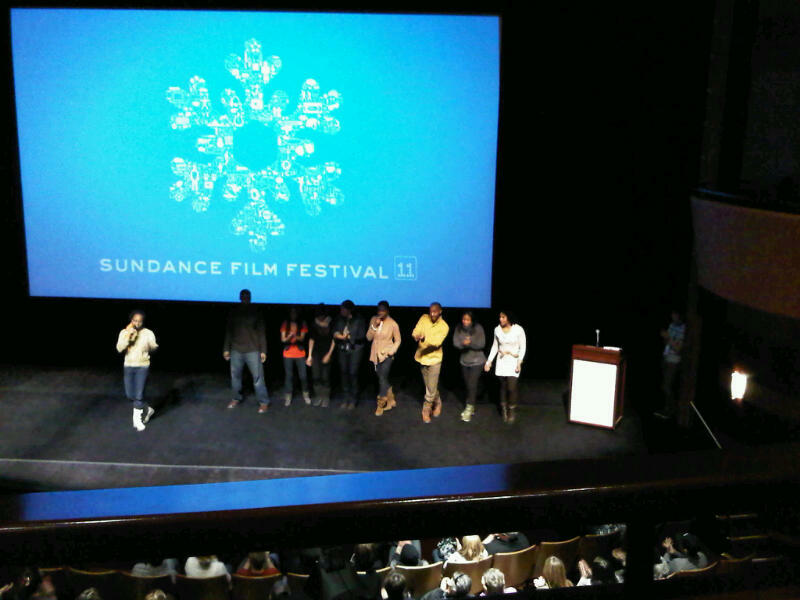 One of the most wonderful perks of being one of the 1650 volunteers at Sundance is the volunteer screenings they hold and I was able to go to two on Thursday. The first film is part of the U.S. Documentary Competition, Being Elmo: A Puppeteer’s Journey. I can’t recommend it enough. It was a bonus that the director, cinematographer (who are wife and husband), and editors were all there to announce the film and do a Q&A at the end. What a labor of love. They’ve been working on the film for over six years and showing it to the volunteers was the first time they’ve shown it to an audience. I think they were very pleased with the audience reaction. I believe it was one of the editors who commented that he noticed every time Elmo the puppet himself was on the screen and talking into the camera was when the audience smiled and laughed the most. What can I say, we all fell under Elmo’s spell. The second film was adapted from a popular UK novel that I read last year called Submarine. It’s one of those quirky, witty, British coming of age films. The cast was great and the art direction and cinematography was way more creative than my mind’s eye when I think back to the way I perceived it as I read it. The audience responded very positively to that film too. As I walked back to my car shivering the whole way I was thinking how I impressed I was that people volunteered for some of the outside jobs like transportation coordinator, helping people in and out of the shuttles. It’s cold here! Volunteer check-in done, theatre training done, now it’s time to see some films before I start my shifts. I’m working at the Temple Theatre which is out of the main thoroughfare in Park City so everyone has to take a shuttle to the venue. I’ve never noticed it on the side of the road before but I’ve been passing it every time I come into Park City. Why is the Temple Theatre named as such? Because the theatre’s “day job” is as the Temple Har Shalom. 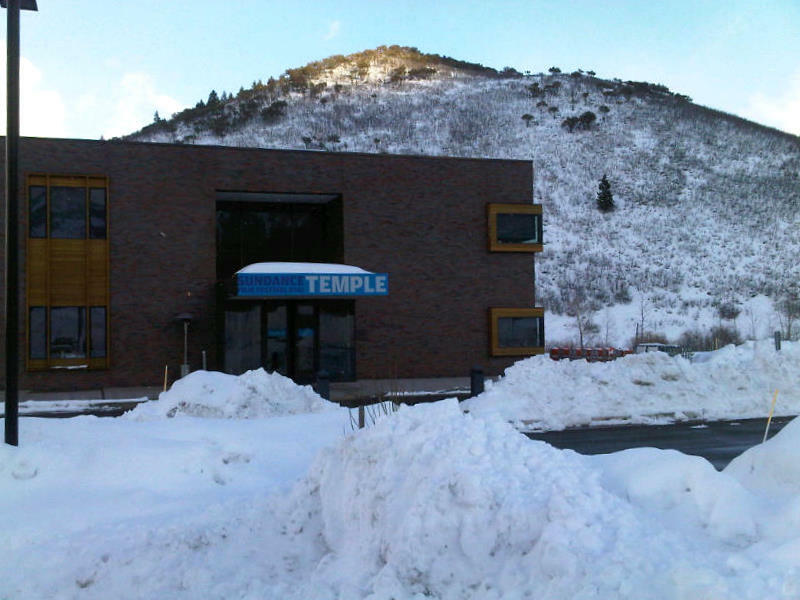 The temple is three years old and during the tour we were told that when it was constructed, they collaborated on the design with Sundance so it could be used as a venue. As we were sitting in stadium style seating in the theatre we were told that this was the same place that services were held. It’s a beautiful building. The films that are shown at this venue are all documentaries this time around. I went yesterday to the Park City Marriott to help with Headquarters setup. This is where festival staff, filmmakers and press will be located during the festival and it was pretty cool to see. I spent my day mostly in logistics where radios, headsets, and other communication devices were being barcoded, scanned, and inventoried among other things. I met a lot of people that I assumed must have worked for the festival but they were volunteers like me. The dedication and the motivation in everyone is obvious in the way they tackle tasks. The excitement for the festival to begin is building. Thought living in Utah would guarantee fresh mountain air? Not so much in the winter. We’ve got something called inversion that happens and here’s a description. It looks foggy when it’s in effect. So we didn’t realize until this week that we might have been contributing to the problem. A coworker said to me “It’s a red burn day in Salt Lake County”. I had to look this up. Again here’s a description. 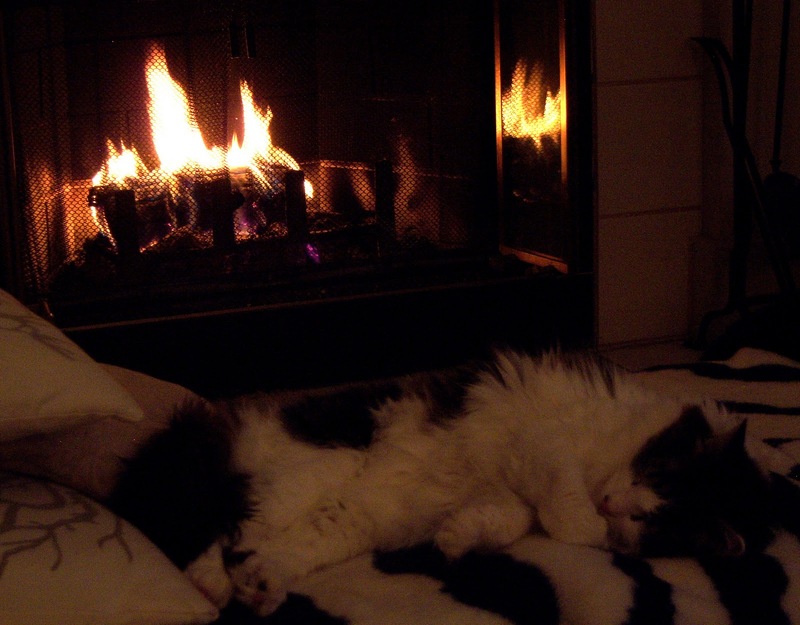 I love having a fireplace again and now we’re wondering, how many days we had fires going when it was a red day?! I need to pay more attention. I was talking to a co-worker one day in the kitchen asking what he did over Christmas and he mentioned that he’d been doing some snowshoeing and cross country skiing. I asked him more about snowshoeing like where one did this and if you could rent the gear. He said that REI rented snowshoes and polls which come in handy. I was interested. Fast forward to last Friday night when H and I went out to dinner. I start telling him about this in the car when we’re coming home, how this co-worker went snowshoeing and how enjoyable it is. After 21 years of marriage, even before I can finish my story I can sense that H is just waiting for me to finish so he could say, what are you getting at here? So I finish the story with, “So would you be interested in trying that?” His tone was hilarious with a touch of outrage that I’d ever suggest such a thing and his response was, “Not especially…what’s the purpose?” Hahaha, and you know, I didn’t have an answer. I only answered his question with another question, something like, “Don’t you want to wear those cool snow shoes?” I don’t remember if there was an expletive in his response but I’m sure you can guess, his answer was no. I’ve been laughing about this conversation for over a week now. I’ve since done some research and found this website which touts snowshoeing as a fast-growing winter sport. Sport? Come on, that’s a bit of a stretch isn’t it? Nevertheless, I am interested in trying it because honestly the idea of skiing or snowboarding scares the devil out of me. This actually got me thinking about that hilarious website Stuff White People Like which I’m listening to on audiobook right now and another popular activity here, snowboarding. Check out what SWPL has to say about snowboarding here. Last weekend was my first weekend volunteering for the Sundance Film Festival. I worked in the box office in Park City. If you live in Summit County, which is where Park City is located, you can register for a timeslot to purchase tickets early. When I arrived for my shift at the box office on Saturday, I was shocked at the number of people. During my shift I probably checked the IDs of about 500 people. The other volunteers were great to work with, especially the veterans who shared lots of festival tips with me. 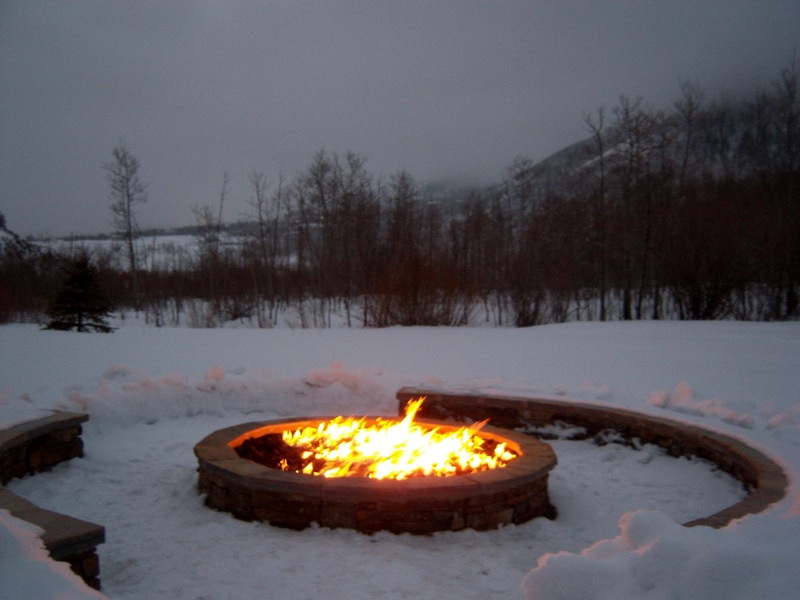 Park City residents in general are posh and usually not year round residents, but just come for ski season. Many of them queued for their tickets directly off the ski slopes still wearing some of their gear. I've never been to Park City during ski season and when I left the box office on Saturday night and walked down Main Street it had an energy that I'd never experienced there before. It's really a great place to visit. 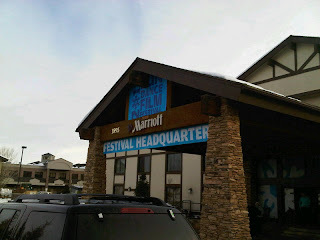 Today I’m off to help set up the headquarters for the festival in Park City. I have some additional training to attend this week and they are screening some of the films for volunteers before the festival which I plan to attend. Everything officially kicks off on Thursday and I can’t wait! If you’re interested in reading about the films being shown at the festival or the festival itself, go here. A co-worker told me yesterday that this Friday night he'd be sleeping outside in a canyon with his eleven year old and his scout troop. He was given the choice of sleeping in a snow trench or a snow cave. Of course the kids think this is the greatest idea in the world but what adult proposed this to the group and how did they all agree? As I was leaving work last week I took this picture. One of my colleagues came out and saw me standing in the parking lot and asked me what I was doing and when I told him that I'm just amazed at how different the mountains can look every day, he said, "I guess I just take it for granted". I have a longtime friend who is also working on a workout plan. It’s been one of our topics of conversations for too long to admit. She’s started seeing a personal trainer, a young man who has one of those Southern frat boy first names that is actually a last name to most people, like Mason or Harper, so while I’m sure he shows up for the sessions in some kind of workout gear, in my mind he shows up in boat shoes with no socks, some plaid shorts and a polo with the collar popped. Her stories about their sessions make me laugh out loud, mostly because when he asks her to do various things she doesn’t give in without a fight. She told me that whenever he asks her to run she asks him to tell her a story to help her through it. I’ve been thinking about this for the past five weeks and it makes me smile every time. I wish he was there with me when I start running telling me a story too. I started this in the UK and didn’t finish it but this time I’m determined. I just finished week 5 of the nine week Couch to 5K running program. Yesterday was the day where I had to run for 20 minutes nonstop for the first time in the program. I told A, who was also running on the track that if I died in the middle to kick me over to the side so I was out of the way for the other runners. I made it through but did require a nap in the afternoon afterwards, lol. I told A we need to plan to run a 5K in the spring. It’s our 2011 goal. The typical signs of the weight loss resolutions are all in place. Yesterday A and I made a run to the mall and in a department store we passed a display of those Skechers Shape-Ups. Contemplating a purchase was an older lady who looked to be accompanied by her adult daughter and her husband. As we passed I heard the daughter say to her mom, “You’ll fall over!” in that what the hell are you thinking you’re not buying those tone. Just as my teenage years flashed in front of my eyes when they said "it's a girl" in the delivery room, my senior years flashed in front of me at that moment, when A will be getting her revenge on me, refusing to let me make a crazy purchase. Do you believe what you’re doing at midnight will prevail through the year? If that’s true I’ll be paying $800 to A when I land on her property in Monopoly. H had to work in the morning so it was just the two of us ringing in the New Year with some homemade sushi, some homemade turkey mini burgers, and sparkling juice. 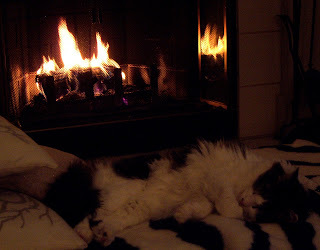 I’m not going to say that I wish all of us a happy 2011. Let’s face it, there will be ups and downs but I hope all of us can find the joy in the happy times here and there.